This special type of hitch is mounted through the bed of your pick-up truck down through the frame to brackets underneath the vehicle. Several weight ratings from 15,000 lbs up to 26,000 lbs are available. 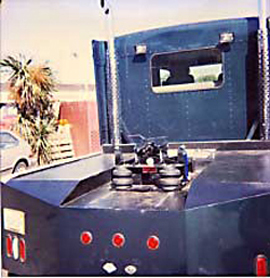 The bed rails are available running parallel with the sides of the truck and also perpendicular to the sides of the truck. Which is best? This is simply a case of whichever you prefer. 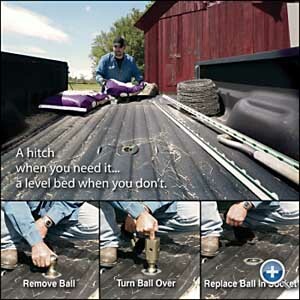 Some people like to slide stuff into the bed of the truck and the hitch pictured below makes that easier. (The entire fifth wheel trailer hitch comes out when you’re not using it, other than the rails that stick up about an inch). If you have a bedliner, we normally, rather than cut into it, even out the surface by adding extra pieces of flat and round steel to drill through, so having a bedliner is not a problem. A sprayed on bedliner must be installed before the hitch is installed. Plastic or rubber laid-in bedliners should be purchased and installed before the fifth wheel hitch is installed. I'd like to mention something called an "air ride trailer hitch". This piece of equipment alleviates the stress on your trailer through the 5th wheel connection from bumpy roads. The air ride system absorbs the shocks your trailer takes as you drive down the road. Many heavy equipment trailers, car haulers and stock and horse trailers have a special hitch coupling system called a gooseneck hitch. A gooseneck hitch is similar to a fifth wheel trailer hitch in that it is mounted through the bed of the truck. It, however utilizes a large removable ball which attaches the trailer to the truck. These hitches can handle loads up to 30,000 lbs! The great news about gooseneck hitches is that the type we normally install, made by a company called B & W Trailer Hitches, is a turnover ball system. That means when you are not towing, you can remove the ball that is sticking up in the bed of your truck, turn it upside down, and lock it into the hole which leaves you a flat truck bed for loading materials. If you want a spray on bedliner, you can have that done either before or after installation of the gooseneck hitch - if you wait till after, the spray on liner will cover up the edges of the flange nicely. You may be wondering if it's possible to install a 5th wheel trailer hitch or gooseneck hitch on your shortbed pickup truck. There are special equipment hitches called "sliding fifth wheel hitches" which may allow you to tow a fifth wheel trailer with your shortbed pickup. It's a situation where some measurements must be taken of both your truck and the trailer you wish to tow before you can tell. Before hitching, make sure both the truck and trailer are on level ground. Connecting the receiver and pinbox will be much easier if both height and side-to-side levels are carefully matched. Raise or lower the front of the trailer so that the king pin height matches that of the coupler assembly in the truck. Open the coupler locking device so that the pin will engage the hitch plate jaws. Slowly back the truck towards the pinbox until the truck tailgate can be raised after clearing the king pin. Keep the king pin and coupler aligned. Continue backing and engage the king pin and coupler completely. Close the coupler locking device. Engage the safety latch. Raise the fifth wheel landing gear. Connect the breakaway switch lanyard. Be sure the lanyard is adjusted so that the switch is not activated during a full “jackknife” turn. Plug the 12-volt electrical cord into the mating receptacle in the truck bed.